For the past week I’ve been playing with the pre-release version of ESRI’s ArcGIS Pro. The operative word is ‘playing’, because this software application is just one heck of a lot of fun to play with. If you are a user of ESRI’s GIS software you’ve likely heard of ArcGIS Pro. ESRI first announced it at the 2012 International User Conference. I was there and watched the software development team lead run through a quick demo. It looked interesting, but at the time I thought it would be little more than a re-packaging of the current version 10.x desktop software – something like a new skin that would sit on top of ArcGIS for Desktop 10.x. With the release of ArcGIS 10.3 in the latter half of 2014 ESRI started to seed out the pre-release version of ArcGIS Pro. Because of other attention grabbing issues I didn’t get the chance to install the software until early last week. ArcGIS Pro is a native 64 bit application. This means the application takes full advantage of all the multi-threaded processing horsepower available in 64 bit desktop systems. ArcGIS for Desktop 10.3 is a mostly 32 bit application and just loafs along on 64 bit hardware. ArcGIS Pro unlocks all the available processor capability (but there’s a price to pay – see ‘issues to be aware of’ below). ArcGIS Pro ‘lives’ in 3D. 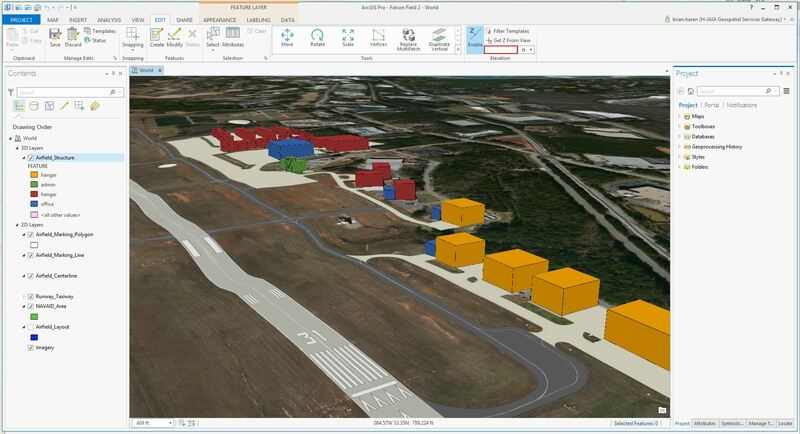 The new 3D visualization and analysis tools in ArcGIS Pro are what make it fun to play with. If you have 3D data (z-enabled) then ArcGIS Pro relates to the data in 3D. If you have simple 2D data (say, building footprints) then it’s easy to turn it into 3D data using the Extrusion toolset. The new ribbon menu interface is context sensitive and works well. Yes, I know ribbon menus have been out for years and are generally well implemented (Microsoft Office), but they can also be poorly done (<cough> AutoCAD <cough>). The default ArcGIS Pro ribbon menu is very well done. It’s clear ESRI spent a lot of time getting this right. ESRI manages to keep most of the workflow options and commands where experienced ArcGIS for Desktop are used to finding them. While there is a learning curve it is fairly short for most common tasks. The 3D navigation tools are well implemented using mouse commands. This functionality is a core part of ArcGIS Pro – it’s there when you open the application. Even if all your data is 2D, you still have immediate access to 3D tools. ArcGIS Pro moves beyond the .mxd map file and introduces the concept of the GIS ‘project’. Think of a project as a collection of map files, data links, configuration files, rules and settings that define a particular GIS project. Projects can be shared across individuals and work groups to help standardize workflows and other processes. Licensing. This is a huge paradigm shift for ESRI. ArcGIS Pro is authorized via ArcGIS Online. The two are tightly linked and can’t be separated. Your ArcGIS Online administrator now authorizes you to use ArcGIS Pro from the new ‘Manage Licenses’ interface in ArcGIS Online. It looks like no more separate license manager, authorization codes and provisioning files! It appears as though you get one ArcGIS Pro license for every ArcGIS for Desktop 10.3 Advanced license you have. This includes those who have a Home Use license. What is the relationship between ArcGIS for Desktop 10.3 and ArcGIS Pro? 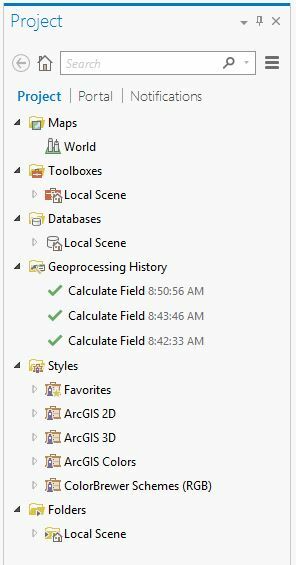 Can ArcGIS Pro stand alone, or does the application have dependencies on 10.3? What about ArcCatalog? There appears to be no ArcGIS Pro equivalent to Catalog. Keep in mind this is pre-release (beta) software. There are still some rough edges. While everything seems to work well I have experienced some crashes. If you do decide to test it, don’t use it for production purposes! This is perhaps the #1 issue to be aware of – ArcGIS Pro is a workstation-class desktop application. Some would classify it as a resource hog, but more accurately it is a fully 64 bit application that makes full use of all available resources. You can forget about running it on your dual core Pentium 4 box running Windows XP. ArcGIS Pro is heavily graphics intensive and demands a fairly robust graphics card. When I first installed ArcGIS Pro on my home computer it quickly brought my cheap 512 MB gaming card to its knees – the card was literally crying for mercy. ESRI recommends at least a 1 GB OpenGL compliant card. I ended up buying a 2 GB NVIDIA Quadro K620 card and that vastly improved performance. Before we close, let’s take a look at a short video that highlights some of the ArcGIS Pro features I discussed above. That’s it for now. As ArcGIS Pro moves out of pre-release and we get more experience with it I’ll come back with updates. But for now, this seems to be a great update and I’m really quite excited about it. Zach, the cost of ArcGIS Pro varies based on licensing requirements. I recommend you contact ESRI directly for more information.